Same song, new verse, as Kevin Harvick still cannot be stopped thus far this season. I keep talking about dominance in NASCAR, but this week I’m taking a different approach because of some comments I keep seeing repeated every week from all forms of social media, whether it be Twitter or Facebook. Once again, Kevin Harvick was victorious in Cup competition. That’s five victories in 12 races, nearly 50% of the first third of the season. Yet despite all the comments of fans and even media alike saying he’s the current championship favorite, there are others that are saying something else. That being they are tired of seeing the same guy dominate every single week. Seems like this is an argument that was heard about 20 years ago as well. Remember back between 1996 and 1998, Jeff Gordon won 33 races over three seasons, and won two championships in that span. The year he didn’t win it, he finished second. But, both title runs he had were much different. In 1997, it came down to the final race and he did not have a pleasant time that finale weekend thanks to a pit road wreck in practice, and him forced to a backup car for the race. He ended up doing just enough to win the title by 14 points that year. In 1998, he not just won the title, he outright dominated the season from the start of the year, to the final checkered flag. He won the championship a week early, and did so with a victory. The final race of the season, he again took the checkered flag, almost as an exclamation point on what was an incredible campaign. About 10 years ago, Kyle Busch was doing the same thing not just in Cup competition, but across all the major series in NASCAR, Xfinity and Camping World Trucks. Fans hated it, pouring down boos like Penn State fans do when the opposing team takes the field at Beaver Stadium. Eventually in both cases, fans understood they were witnessing a generational driver that likely wasn’t going to be matched. 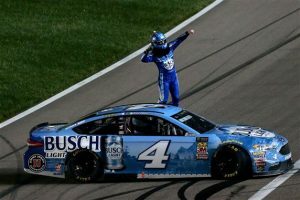 In Busch’s case, when he got hurt in 2015, he came back to win the championship, and fans realized that what he did that year by winning races, and a title, with a shorter campaign was a feat no one may match. Each driver was driven to succeed in their own way, and have done so. So what’s the problem with Harvick’s season? It’s no different thus far through 12 races, because he’s both dominating and having adversity to overcome. He even had benefits of one victory taken away because of a broken part that wasn’t his fault. No matter what,, Harvick’s season has been absolutely amazing by all accounts. The question is…can he keep it up, because even the best can falter at any moment. CAUTIONS: 6 for 31 laps. Lap 32-35 (Competition Caution); 82-88 (End of Stage 1); 162-167 (End of Stage 2); 238-242 (No. 88, 19 Incident-BS); 249-252 (No. 12, 42 Incident-T1); 254-258 (No. 24, 14, 31, 1, 6, 37, 13-FS [Red Flag 13 Mins, 13 Secs.]). LEAD CHANGES: 13 among 7 drivers. K. Harvick 1-32; R. Blaney 33-84; K. Harvick 85-123; R. Blaney 124-125; A. Dillon 126-129; K. Harvick 130; K. Larson 131-213; J. Logano 214-215; R. Stenhouse Jr. 216-225; K. Larson 226-243; K. Harvick 244-248; J. Logano 249-252; M. Truex Jr. 253-265; K. Harvick 266-267. TIME OF RACE: 2 Hrs, 53 Mins, 38 Secs.